This DIY tablecloth is great for quick and creative table decoration, bringing simple and elegant design idea into modern busy lifestyle. 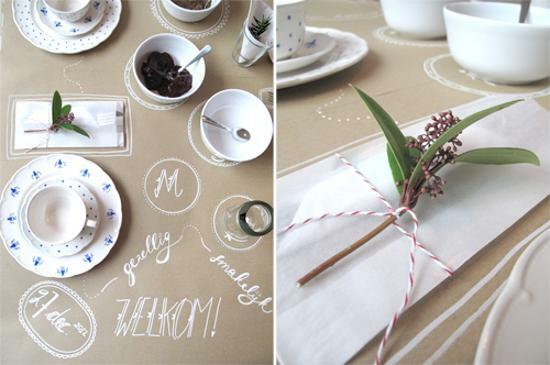 Good for any party theme, paper tablecloth help your party go smoothly. Creatively decorated, simple tablecloth made of recycled paper enhances your party theme and well coordinate with paper napkins, plates, cups and goody bags. 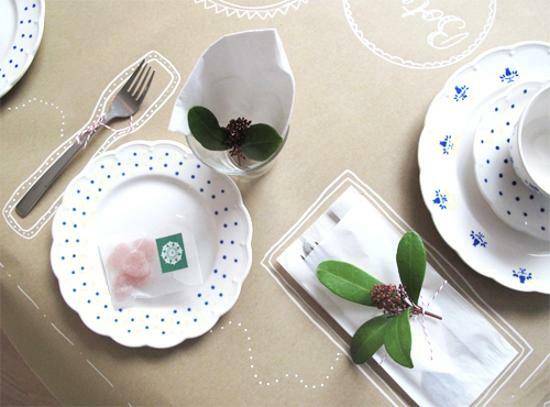 Fun and functional, made of recycled tablecloth is a nice table decoration, which makes life a lot easier and brighter. With this disposable tablecloth, it is easy to folded it up and thrown into the garbage. A quick move and the whole mess is taken care of. 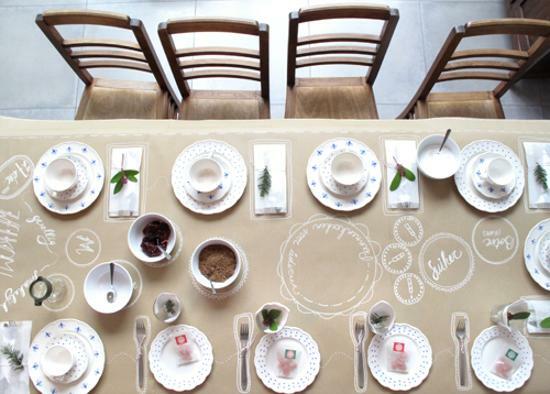 Easy and practical entertaining items are a trend in decorating party tables. 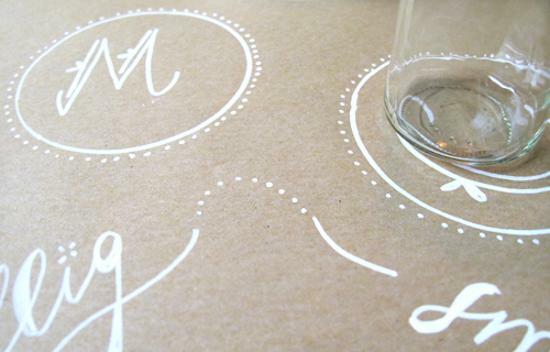 This paper tablecloth takes this modern trend one step further. With just a little planning and creative art ideas, the paper tablecloth can be turned into true table decoration that enriches your party theme. A party is tiring enough without endless washing and clean ups afterwards. 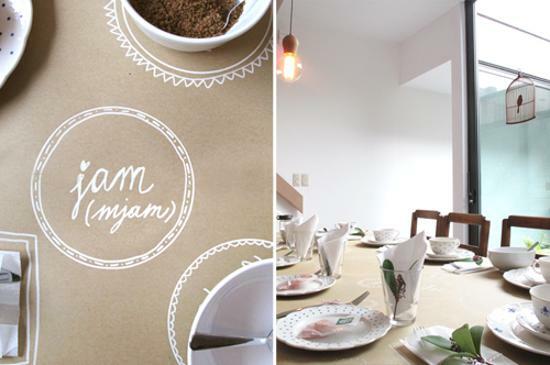 Personalized and hand painted paper tablecloth is a great idea allowing to save energy for more important things than cleaning. The paper tablecloth can be quickly decorated to reflect best wishes, congratulations or happy birthday sentiments. Little else is needed to set the mood for a fun and enjoyable occasion. In the case of a birthday party for children the paper tablecloth is the best choice for table decoration. Our kitchen is the most multifunctional spaces, so practical and east table decoration with paper tablecloth is very convenient way to create beautiful table decor. What could be more clever than a paper tablecloth decorated in unique and meaningful way. Drawing and writing is no problem on made of recycled paper tablecloth. Then you can just throw away it after the party. All you need is a white acrylic pen to start to draw on brown craft paper. Personal letters and wishes, funny images or holiday symbols are great for creating unique tablecloth and personalize your party table decoration. Party themes and tablecloth images can vary from one season to another. Cartoon characters, sports, movies, TV shows, holidays, and unique, funny, unusual or crazy fun theme ideas help add a personal touch to simple and practical paper tablecloth.